Summary: 500pc of flexible sticks that can be used over and over again for endless fun. Need a gift idea but want it to be unique and have endless amounts of use? Then the Bendaroos is something you should consider. 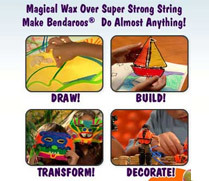 With the Bendaroos, kids will have endless hours of fun as each Bendaroo stick bends and unbends again. They are fun, safe and easy to use. – No Glue, No Stains, and best of all, no mess. – They'll always hold their shape. – Be creative and create your favorite animals and more.